All slides are in .pdf format. Bijker, Wiebe. 1995. "King of the Road: The Social Construction of the Safety Bicycle," pp. 19 - 100 in Wiebe Bijker, Of Bicycles, Bakelites, and Bulbs: Towards a Theory of Sociotechnical Change. Cambridge, MA: MIT Press. Robinson, Andrew. 1995. The Story of Writing. London: Thames & Hudson. Ch 13, "From Hieroglyphs to Alphabets -- and Back?" pp. 210-217. Goody, Jack and Ian Watt. 1988. "The Consequences of Literacy," from Jack Goody, ed., Literacy in Traditional Societies (Cambridge University Press, 1968). Part 1 and Part 2. Also available at JSTOR in .pdf format. Trithemius, Johannes. 1974/1492. In Praise of Scribes. R. Behrendt, ed. Lawrence, KA: Coronado Press. pp. 35-69 & 89-97. Eisenstein, Elizabeth. 1983. "Some Features of Print Culture," pp 42-91 in Elizabeth Eisenstein, The Printing Revolution in Early Modern Europe. Cambridge, UK: Cambridge University Press. Cowan, Brian. 2005. "Inventing the Coffee House" and "Penny Universities," pp. 79-112 in The Social Life of Coffee: The Emergence of the British Coffeehouse. New Haven. Yale University Press. Darnton, Robert. 2000. "An Early Information Society: News and the Media in Eighteenth-Century Paris." American Historical Review 105.1. Sprat, Thomas. 1667. pp 60-79 in The History of the Royal Society of London for the Improving of Natural Knowledge London. Read from: from p. 60 "I come now to the Second Period of my Narration..." to p. 79, "The Royal Society will become Immortal." Stubbe, Henry. 1670. 'Mistakes about the Sweating-Sicknes, and its Cure,' pp. 23-25 in Legends No Histories, or, A Specimen of Some Animadversions upon the History of the Royal Society. London. Available at Early English Books Online. Headrick, Daniel R. 2000. "Displaying Information: Maps and Graphs," pp 96-141 in When Information Came of Age: Technologies of Knowledge in the Age of Reason and Revolution, 1700-1850. Oxford: Oxford University Press. Thompson, E.P. 1967. Time, Work-Discipline, and Industrial Capitalism. Past & Present 38 (Dec): 56-97. Edwards, James Don. 1960. Early Bookkeeping and its Development into Accounting. Business History Review 34(4): 446-458..
Stone, Lawrence. 1969. "Literacy and Education in England 1640-1900." Past and Present 42: 69-139 (necessary to read only to p. 102). Garrison, Dee. 1979. "The Social Ideals of Early Library Leaders," pp 36-63 in Apostles of Culture: The Public Librarian and American Society, 1876-1920. Madison: University of Wisconsin Press. Schudson, Michael, 1978. pp. 13-60 in Discovering the News. New York: Basic Books. Mindich, David. 1998. "Nonpartisanship," pp. 40-63 in Just the Facts: How "Objectivity" Came to Define American Journalism. New York: NYU Press. Friedlander, Amy. 1995. 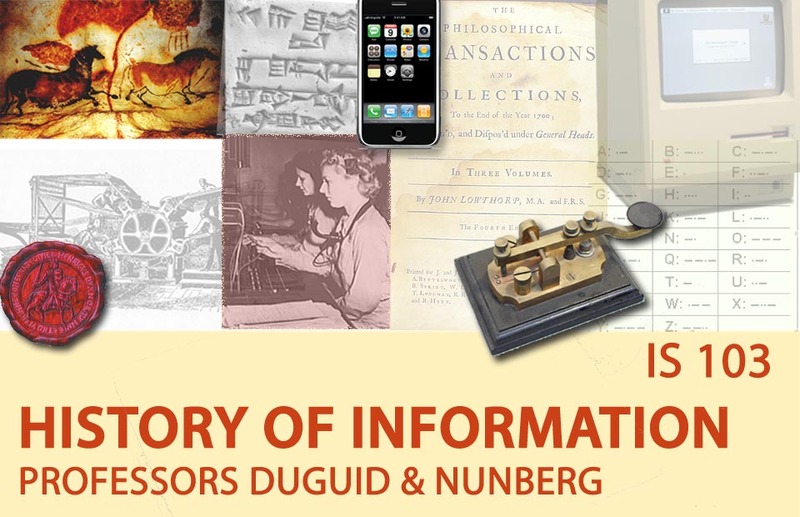 'Telegraphy: The Precursor to Telephony, 1837-1873' and 'The Period of Patent Monopoly, 1873-1894', pp 10-38 in Amy Friedlander, Natural Monopoly and Universal Service: Telephones and Telegraphs in the U.S. Communications Infrastructure, 1837-1940. Washington, D.C. CNRI. Sun Tzu. nd. "The Use of Spies," chapter 13 of The Art of War, Lionel Giles, trans. Warner, Michael. 2006. "The Divine Skein: Sun Tzu on Intelligence." Intelligence& National Security 21(4): 483-492. *Mercado, Stephen C. Reexamining the Distinction Between Open Information and Secrets Studies in Intelligence 49(2). Newhall, Beaumont, "Prints from Paper," "Portraits for the Million," "The Faithful Witness," and "The Conquest of Action," pp. 32-57, 66-95 in The History of Photography, From 1839 to the Present Day. New York: Museum of Modern Art, 1964. Alan Trachtenberg, "Albums of War," Ch. 2 of American Photographs: Images as History from Matthew Brady to Walker Evans. (pp 71-118). New York: Hill and Wang. Starr, Paul, 2004. "The Creation of the Media," Ch. 10-11, pp. 327-384. New York City, NY: Basic Books. Marquis, Alice Goldfarb. 1984. "Written on the Wind: The Impact of Radio during the 1930s." Journal of Contemporary History 19 (3): 385-415. Marlin, Randall, 2002. "History of Propaganda," pp. 43-94 in Propaganda and the Ethics of Persuasion, Toronto: Broadview Press. Taylor, Richard. 1998. "Triumph of the Will," Ch. 13 (pp. 162-173) of Film Propaganda: Soviet Russia and Nazi Germany. London: Tauris. Barsam, Richard M. 1973. "American Films for World War II," Ch 10 (pp 216-229) of Nonfiction Film: A Critical History. Bloomington: Indiana University Press. excerpts from Leni Riefenstahl's Triumph of the Will (0:00-11:00, 41:20-55:10, 1:35-end). Frank Capra's Why We Fight #1, Prelude to War (1943). McKendrick, Neil. 1982. "Josiah Wedgwood and the Commercialization of the Potteries," pp. 100-145 in McKendrick et al. Birth of a Consumer Society. Bloomington, IN: Indiana University Press. *Babbage, Charles. 1835. "Registering Operations" and "On the Method of Observing Manufacturies," chapters 8 & 12 in Economy and Machinery of Manufactures. Campbell-Kelly, Martin & William Aspray. 1996. "'Babbage's Dream Comes True," (pp. 53-104) in Martin Campbell-Kelly & William Aspray, Computer: A History of the Information Machine. New York: Basic Books. O'Reilly, Tim. 2005. What Is Web 2.0: Patterns and Business Models for the Next Generation of Software. Keen, Andrew. 2007. Introduction and The Great Seduction, pp 1-33 in The Cult of the Amateur. New York: Doubleday. DiMaggio, Paul, Eszter Hargittai, W. Russell Neuman,and John P. Robinson. 2001. "Social Implications of the Internet," Annual Review of Sociology. 27:307–36. Nunberg, Geoffrey. 2002. "Will the Internet Always Speak English?" American Prospect, Nov. 30. There will be 10 readings assignments, each involving submission of a one-paragraph answer to one of a list of several questions about the reading. Assignments are due on the day of the reading; no late assignments will be accepted. Assignments will not be letter-graded but only checked off as acceptable. Each student will get 2 free rides for missed assignments. Three essay questions, two from a list of questions provided in advance. One 10-point short-answer section asking for names, dates, etc. Five essay questions, most chosen from a list of questions provided in advance. One 10-point short-answer section asking for names, dates, etc.